Infinity BBQ Grill Replacement Parts. Free Shipping for control valves, thermocouple, lights and covers and more. The Infinity gas grill had a very short, bright life span. 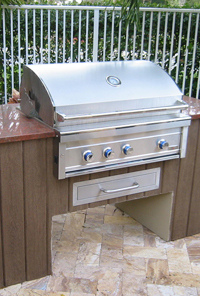 The barbecue models were designed and manufactured by someone from another popular grill company and after a few years in business they were having legal issues and went out of business. When that happened we grabbed as many replacement parts as we could get from their distributors throughout the country. Unfortunaetly we have had to use other grill parts in the Infinity models but after 6 years of selling these grills we have had less than 3 service calls. The Infinity was made much better than its price tag would suggest. If you need an Infinity replacement part that is not listed to ship to you on this page please contact Majestic Grill Parts at 954-2-Grill-2 which is also 954-247-4552 and we will add whatever grill parts you need. Stainless steel burner replacement fits Infinity barbecue grills. Click burner detail above to see replacement burner design in action. This is a Great fit. Briquette radiant tray for Infinity gas grill. Stainless Steel briquette tray. Click here for Infinity Briquette tray options. Infinity briquette tray radiant shields were 17.25 inches deep and 12 7/8 inches wide with hard, white porcelain briquettes locked to the stainless tray installed above the U burner. 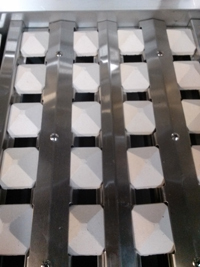 Although no longer available, the replacement briquette tray fits without briquette locks. Gravity works fine. Replacement infrared burner for Infinity gas grill models. Use this burner to replace an infrared searing burner in infrared Infinity models. This burner can also be installed as a replacement for the U burners that come standard on the other models. In these images we are showing that our replacement infrared gas grill burner can fit perfectly into the Infinity grill that is 30 inches wide. Infinity Infrared Burner Information. $195. Control valve replacement for Infinity brand barbecue grill models. 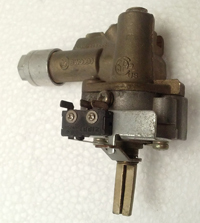 The control has a point switch at the base of the valve stem so the ignition connects when the control is depressed to turn. This valve also activates the ignitor. Valve clamps to manifold and uses a hood orifice, not included. Safety valve control for infrared rotisserie burner on Infinity gas grill models. This valve has an internal solenoid affected by the thermocouple to control gas flow and ensure no gas leaks at the burner. Infinity control valve has a mechanical module integrated to the controls. When the knob is turned the mechanics snap to cause a spark at the electrode which plugs directly into this control valve. Three Grid sections 10.5 inches wide. LP hose with QCC type one regulator fits all Infinity gas barbecue grills using liquid propane cylinders. Twenty-four inch gas hose has 3/8 flared female fitting for BBQ manifold attachment. If a half-inch flare or pipe adaptor is necessary simply let us know. 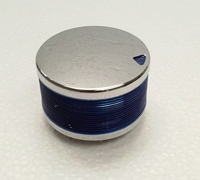 Infinity control knob mirror stainless finish with blue ribbed texture. Standard grill ignition electrode for Infinity barbecue grills. 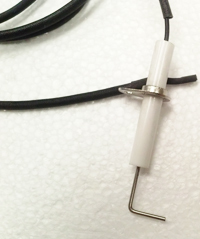 The wire on this electrode is 47 inches from the mounting bracket to the wire plug to be used with the Infinity infrared rotisserie burner ignitor. Replacement electrode for Infinity gas grill infrared sear burners in 36 inch and larger barbecue models that had an infrared burner installed. Light cover replacement for Infinity gas grills. These barbecues had lights mounted above the rotisserie burner but the light covers can become greasy and dirty from barbecuing. These are the original Infinity light covers. Light bulb replacement for Infinity gas grill light features. Ignitor module replacement spark generator. 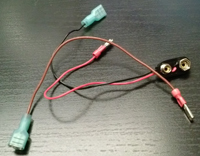 The nine volt battery wires connect to the module and then connect to the momentary button or switch mounted in the control panel. Module has 4 outlet connections to connect up to 4 electrodes in the barbecue grill. Infinity Ignition Instructions and Video $39. 4-spark module for barbeque grill ignition. The power pack battery attaches to this module that then has 4 tabs to attach 4 electrodes to ignite as many as 4 burners. 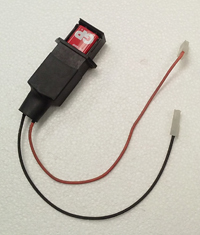 This gas grill ignitor module can be used for multiple grill models to light up to 4 burners including the infrared rotisserie. Infinity Ignition Instructions and Video $50. 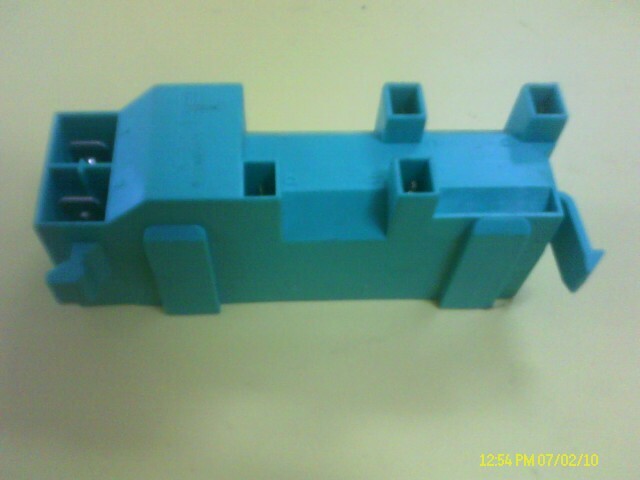 Replacement electric module spark generator has two electrode spade outlet connections. Battery plugs right into module. The nine-volt module has 2 male electrode spade plugs and 2 larger male spades for the button wires. Module Details and Testing $40. Nine volt ignition module installs to separate 9v battery supply and momentary or control valve micro-switches. Ignition connection attaches nine volt battery to the ignition module item 8824417 but can be used in any similar ignition design in any barbecue. The red wire has an interuption so a button can be added or the connection wired to switches on control valve. This causes the power to the module to flow only when the valve or the button is pressed and the electrodes only spark at that time. Battery drawer replacement to repair Infinity gas BBQ grill models. Battery drawer plugs into module to provide power to electrodes that spark to ignite grill burners. Infinity Ignition Instructions and Video $20. Momentary switch for ignition controls. 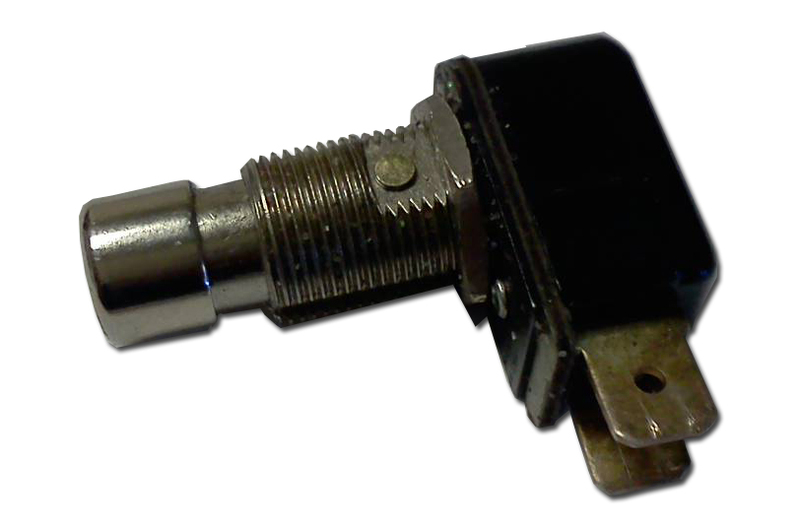 Stainless momentary switch is threaded with a thin nut to tighten to control panel. Infinity button switch turns on lights in Infinity gas grill models with barbecue lights inside the grill. Mounting bracket for hood handle on Infinity BBQ models. Sometimes the handle brackets bubble and peel and need to be replaced. Thermocouple replacement to repair rotisserie safety control in Infinity gas grills. The base of the thermocouple screws into the safety valve and the tip mounts in the flames of the rotisserie infrared burner. Electrical wire replacement attaches rotisserie motor to electricity in Infinity gas grill. Infinity gas barbecues did not last long in the world of high end appliances. They were first shown at a builders show about 5 years ago and already the company is gone. They were manufacturing infrared saunas and barbecue grills, outdoor kitchens and built in island accessories like doors, drawers, UL rated outdoor refrigeration, built in sinks, ice drawers and other built-in accessories. We bought a lot of these because the 36 inch model had internal lights, infrared rotisserie, infrared searing burner in the grill and heavy grill burners. The briquettes installed above the convection burners had briquettes locked into the stainless vaporizer shield so the barbecue couls radiate heat as a grill. The 36 inch model cost about a thousand dollars less than other 36 inch built in gas grills at the time. 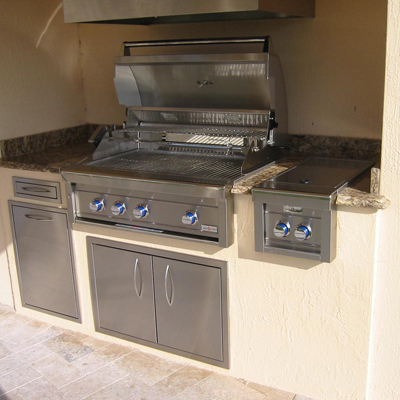 This Infinity built-in BBQ grill is the 36 inch model in a custom outdoor kitchen we built in Davie Florida. 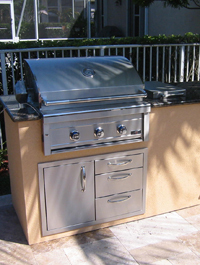 The 36 inch models came standard with three main burners,an infrared rotisserie, an infrared sear burner inside the barbecie, internal lights and heavy flat-top cooking grates designed for perfect sear marks and easy maintenance.